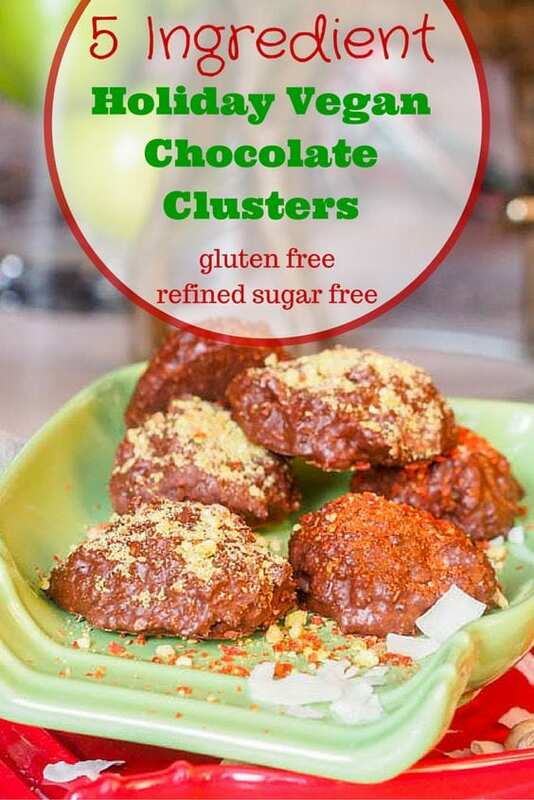 Five ingredient festive holiday vegan chocolate clusters come together in literally minutes. Whip up toasted coconut with dates into the food processor into a smooth paste before adding cashew butter, cacao powder and coconut oil. Rich, nutty and chocolaty. One thing I do love about being home and in the US is the accessibility of all sorts of ingredients. In the US, and especially at home where I have all sorts of kitchen gadgets at the grocery store you can find so many different ingredients. From the most standard to the very strange and exotic. It’s all there. If you go to a specialty store, there the selections are even greater. I mean, I could spend hours and hundreds of dollars in those places. Literally my first grocery trip in the US I spent over $200 on nut butters, seeds, nuts, berries, powders, spices, – pretty much everything and anything I could not find while house sitting in Costa Rica. And these clusters are the combination of those ingredients. My parents each have an incredible sweet tooth, as well as D, of course. My goal is always to whip up a healthy and delicious dessert sweet treat so that they’re not just eating straight sugar and processed sweets. I have made all sorts of clusters before (from my vegan coconut almond clusters to my chocolate hazelnut nut clusters and everything in between). These vegan chocolate clusters might be my favorite though. 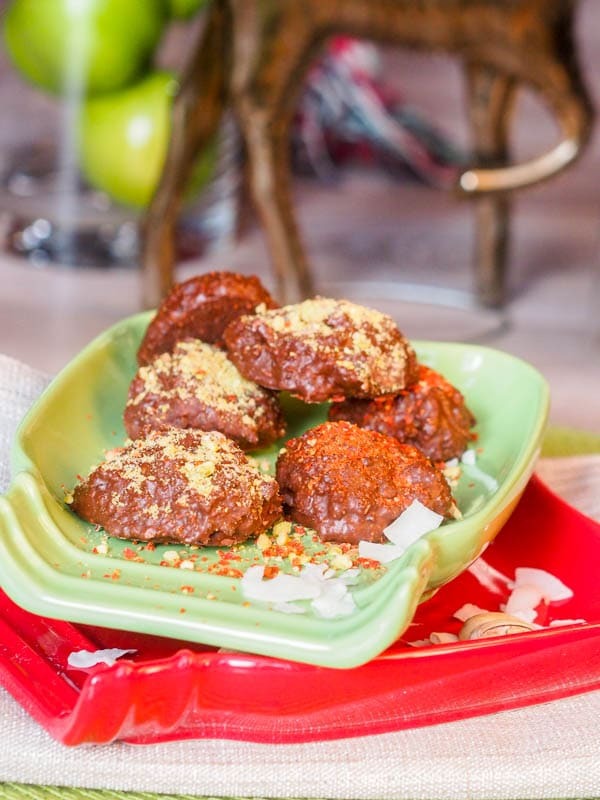 Made with only five ingredients – toasted coconut flakes, dates, cashew butter, cacao power and coconut oil, these are gluten-free and refined sugar free as well as being vegan. Pretty much healthy if you will. Also cacao powder is not to be confused with cocoa powder — the difference being that cacao is basically the raw form of chocolate and and cocoa is the processed form – once cacao has been roasted and sweeteners normally have been added. Cacao is rich in a ton of different nutrients as well as being a great source of antioxidants (though unfortunately a lot of this is lost when it gets turned into cocoa). After a quick tour of a Chocolate Farm in Panama, I feel like my eyes have really been opened to the whole fascinating chocolate making process (and I am now a big buyer of both cacao powder and cacao nibs — all the good stuff is in both of these). So in these vegan chocolate clusters we’ve got vitamins and nutrients from the cashew butter and cacao butter as well as sweetness added in from the dried dates (saves us from having to use processed sugar) and the toasted coconut and coconut oil bind everything together. 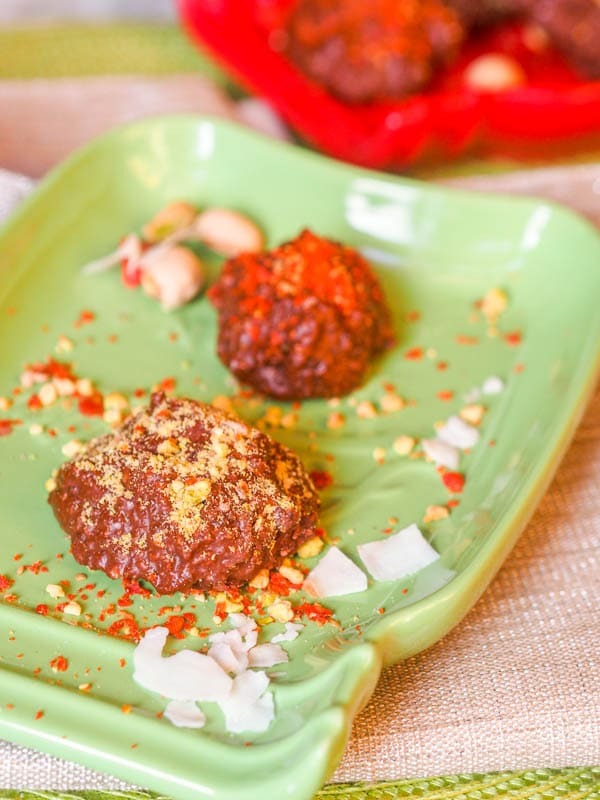 These bites are perfect when frozen for just a few minutes and even more festive when sprinkled with red and green crushed goji berries and pistachios. They are super rich in chocolate flavors as well as being uber nutty at the same time! A feel good holiday treat right here! 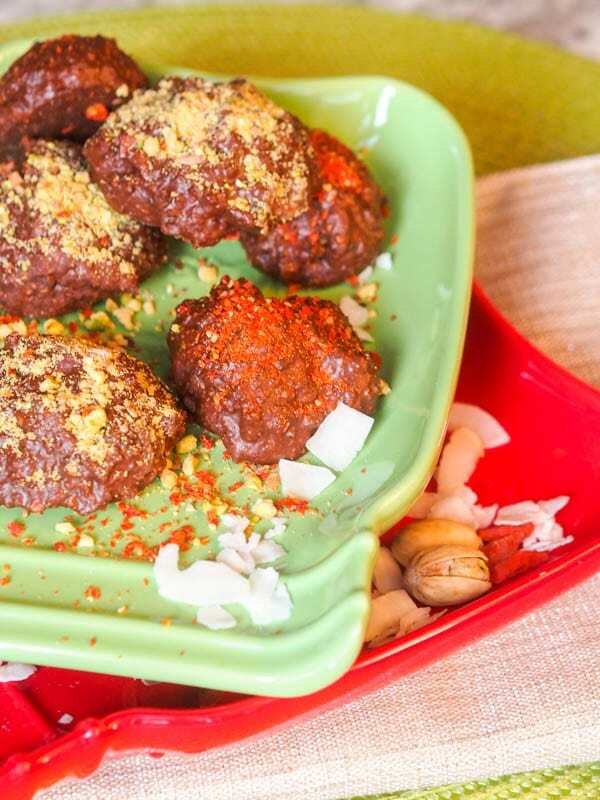 Vegan chocolate clusters come together in literally minutes. Whip up toasted coconut with dates into the food processor into a smooth paste before adding cashew butter, cacao powder and coconut oil. Rich, nutty and chocolaty. 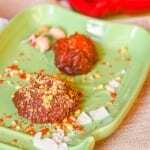 Pulse toasted coconut flakes and dates in food processor until smooth paste forms. Add cashew butter, cacao powder and coconut oil. Pulse until smooth. Form 6 clusters from the mix and freeze for 10-20 minutes. 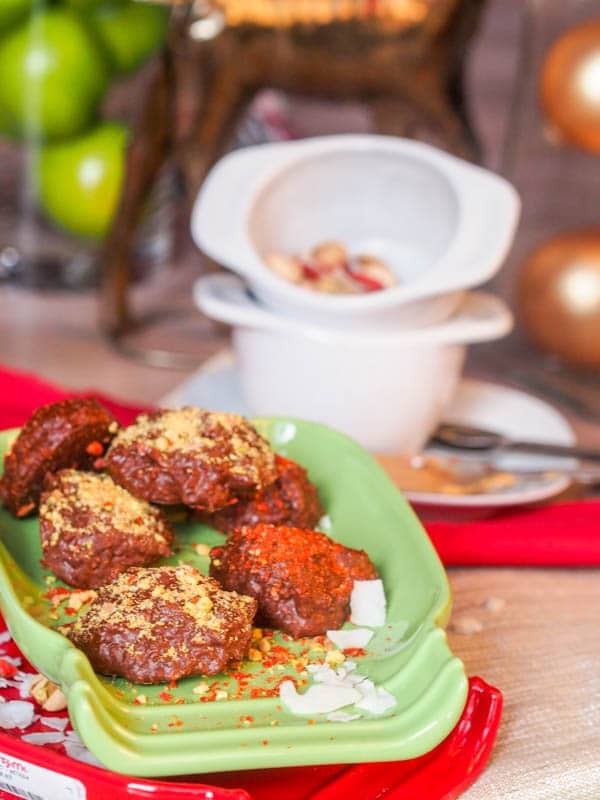 Optional: Sprinkle with crushed pistachios and goji berries for a festive red and green holiday treat. These look delicious AND healthy! Thanks! Best of both worlds here. OOooh yum! I love your presentation. I’m always looking for unique, healthy recipes. I can really get down with these! Thanks! Yes these take care of your sweet cravings while also sneaking in a bunch of good vitamins/nutrients! Sounds like such a delicious recipe, love chocolate clusters. Oooh, yummy! These look great! Yummy, I love the addition of coconut oil, it lends such an awesome flavor and texture!